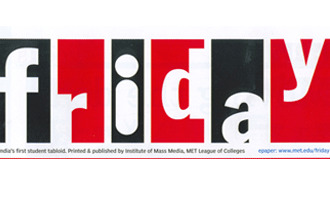 The students from MET Institute of Mass Media have spearheaded a journalistic initiative through 'FRIDAY' - a fortnightly tabloid. Targeted at the youth, the tabloid will feature articles and information on fashion, lifestyle, food, celebrities, finance, sports and Bollywood along with happenings in and around Bandra and Khar. 'Friday' is distributed complimentary at various outlets in and around Bandra.